The lack of sweetness and harsh vinegar made this not a very pleasant of sauce out of the jar, although by no means the worse. Then the loss of flavor combined with poor grilling properties showed it wasn't suitable for cooking. The label states this can be used to dress anything from ribs to gravies to fried chicken, but I think if you want those tasting the best they can, this isn't sauce to be using. Johnny Harris started up his barbecue venture with a small roadside shack in Savannah, Georgia in 1924. It wasn't long until he teamed up with Kermit "Red" Donaldson at the restaurant, and by 1936 they had outgrown the original location and built a new place down the street. Johnny Harris passed in 1942, but the business continued under Red's leadership, including the production of the sauce that was passed on to him. It wasn't until 1959, when Red had to temporarily leave the restaurant due to illness, that he was able to focus on the sauce and flourish the business behind it. Red passed in 1969, but the sauce continues to be produced by his son Phillip and later, Phillip's son-in-law Bernard "B.J." Lowenthal. 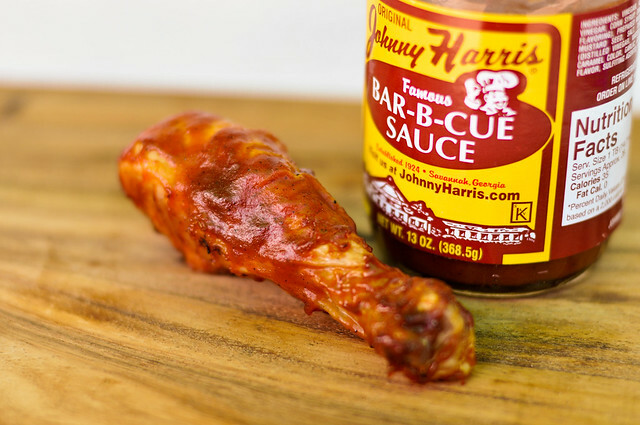 Today Johnny Harris produces four different barbecue sauces along with rubs, a hot wing sauce, and steak sauce. This sauce stings the nose with it's heavy dose of vinegar. There's a ketchup base there, but the sweetness is overtaken by the tang of vinegar. Onion and Worcestershire are also pretty strong contenders in the aroma department. Running medium-thin and drizzly, this smooth, rusty orange sauce is opaque but shows clear specks of spices. There's not much sweetness to be had here, with vinegar getting all up in your face at first, followed by a wallop of Worcestershire that leaves you with a complex and bitter flavor. Like the smell, onion is also pretty strong, along with a peppery kick. Definitely constructed for dipping over grilling, this sauce did not stand up well when taken to the flames. The sauce just sat on top of the chicken, never baking in or caramelizing. The strong flavors that I wasn't so crazy about raw, almost disappeared after being grilled, but were not replaced by anything, leaving a pretty blah tasting chicken on top of one that wasn't very pretty to look at. Johnny Harris restaurant is a sentimental Savannah institution, although its barbecue isn't very good. I bought some of their sauce and about the only two things I've found that it compliments are barbecued bologna and chicken nuggets. My family has grown up with Johnny Harris sauce. We have used only this sauce for years and the ribs we make are gone within minutes everytime we entertain. We send bottles up north to family and friends who can't find it locally. This sauce is not like the commercial tasting ones like Kraft. The beloved restaurant itself is a piece of Savannah's history.This reviewer sounds like he has a limited palate. Confused? I grew up on the sauce. I always grab a new sauce that pops onto the shelf just to see if anyone can out do this stuff. Nothing ever measures up. It's like the droid to the Iphone. There are a lot of wannabees, but nothing ever measures up. One suggestion to the dude who did this analysis is to read the label. It's a sauce, not a marinade. It's got tomato sauce in the recipe so it will scortch. Be fair to the folks at Johnny Harris. Get some culinary experience if you are going to critique a place that knows more about sauce than you. Read the instructions. This sauce is a finished sauce and you add it to the ribs or chicken after cooking or just before taking them off the fire. It's the best tasting BBQ sauce I've ever tasted. You need to try it again and use the correct cooking procedure.This was the worst review I've ever read. Don't put it in writing until you have the facts. Jeez - The Paula Deen lovers society has weighted in on Johnny Harris. "Heat sauce to double flavor". Quote, unquote. A fact. Right on the freakin' label. Maybe those who getting their bloomers in a wad over the review are the ones with "limited palates" and are lacking in "culinary experience". Maybe this stuff is suppose to taste better if eaten in a tacky buffet full of old yankees who are disgorged by tour busses in front of tourist pits that are dished up by the Food Network. QUOTE After five hours, brush liberally with heated Johnny Harris barbecue sauce and continue cooking for another hour. Quick Paul, write to Johnny Harris Co. and tell them that they're not following your instructions. I know they'll rest easier at night. Happy to see this debate, this is what makes barbecue sauce so great--there are so many forms and tastes that there is something for everyone to take sides with. I test all of my sauces the same, and based on my experience, I firmly stand behind my review of this sauce as it compared against other sauces I've tested. @Joe Cowen @Paul Daniels You can see how I use each sauce on the grill, which is as a baste and not a marinade. The issue with this sauce was not that it burned, but quite the opposite, it didn't caramelize or bake into the chicken. To each their own, I suppose, but I'll go on the record to say that Johnny Harris Original is the finest baste available. I live in Canada, and go to the trouble/expense of shipping cases of the stuff to friends and relatives in the US, just so I can have a ready supply on hand. 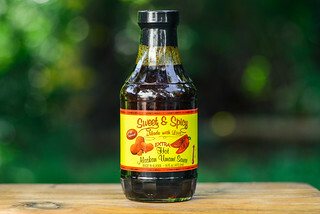 I especially like this with chicken - I've never liked sweet as much as savory, and the tomato/vinegar base, combined with low sugar content makes this best for avoiding flareups and scorching. Left exposed to open coals or jets, virtually any sauce can burn, so just use your common sense - grill indirectly, or over a drip pan, and this will prove to be one hell of a complement to your meat & chicken. You are joking, right? As a 52 year old family man grilling machine from eastern NC I can tell everyone if you follow the instructions and heat it a little before eating with your grillled chicken you will probably be looking for it at every market and finally ordering it online like I have. Eastern NC pork BBQ is consistently ranked as some of the best in the world and we use a vinegar base. So the vinegar kick along with the mustard tang fills our cookie around here. It makes me look forward to trying some of that eastern SC mustard based pork BBQ in Charleston the next time I'm down. OK so I have read the reviews and just happened to notice one of my local grocery stores here in Missouri had this for sale. I bought a bottle about a month ago and got a chance to smoke some butts last weekend. Opened-up the bottle and heated some up on the stove. I thought it was delightful on pulled pork. I can understand how the majority of people (especially those who think BBQ sauce has to be sweet and smokey) would not care for this. I thought it was in the same family as the KC sauce Gates & sons as well as the Texas sauce Stubbs. 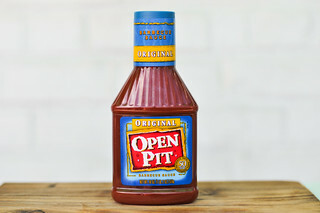 I love all types of BBQ sauce (hell I even like open pit). I found the vinegar/mustard taste was awesome on pork and I think it would be very good on chicken as well. I will buy this again I am sure. Just did a church function and served up about 40 pounds of smoked shoulder. I had 2 sauces available, a sweet sauce (Sweet Baby Rays) and a tangy sauce (Johnny Harris). Both were heated-up and I got rave reviews from people who tried Johnnys. Now, all the Baby Rays was gone because people here in Missouri love their sugar sauces but I'd say 80 percent of the Johnnys was also gone. This stuff is the bomb on pulled pork ! Make sure you heat it, like the bottle says. FAMOUS!!! Might have been back in the day. Poor service, very dirty and fried chicken was over cooked. Would not recommend!! 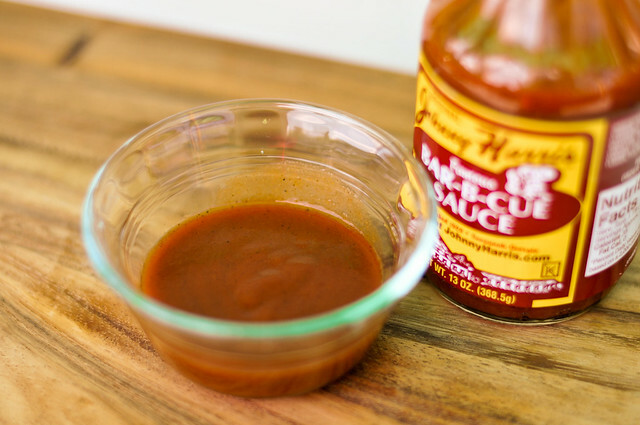 I remember this sauce from nine years living in Savannah as a teen-ager and enjoying after-party nights at the Johnny Harris supper club where I would invariably have the best-ever barbecued lamb sandwich on rye -- with this sauce! After trying for years to no avail to duplicate it at home, I started buying it whenever I went back to GA. Here in TN the preference goes between the MO sweet and the NC tangy, but I'll take the vinegar base every time. As one who has taken trophies in three local contests, I would say my palate has been in sync with judges. The only other sauce I'd like to be able to make is one from a SW GA farmer who used to pit barbecue for my uncle when I was a child many decades ago. Really wish I knew his name so I could ask his family for the recipe. When I met my girlfriend she had just moved to Atlanta from up north. She fell in love with this sauce the first time I grilled pork ribs. She has now been transferred by her company to Boston. I used to send her three bottles every time she ran out but now I have to send a case because her friends love it so much that three bottles are gone in a week. Also, I have converted many sweet sauce lovers to Johnny Harris. I have tried many other sauces but this one is the best. I just tried this sauce I love it so tired of everything being sweet.This sauce reminds me of a sauce the Derby company made just a tad bit less vinegar. I have yet to try and heat It up. Just bought my second bottle. growing up I never had put anthing sweet on ribs Dad had a bbq resturant and used Derby bbq sauce so thank you.! I think the lack of sweetness is what hooked me. All my adult life since leaving Savannah, I've looked for something that could take it's place, but never found it. Even tried to duplicate it in my own kitchen too many times to count. Now I stock up whenever I visit GA. It's great on a cold meatloaf sandwich, by the way. Nothing else comes close! My husband used to not like Johnny Harris sauce. Until I grilled some chicken for him. I follow my mother's initiative and add about a tablespoon of butter to a cup of sauce and heat til the butter is melted. Cook the chicken on a slow grill until it is done, then baste with the heated sauce. Keep on grill until the sauce is baked about dry. There is nothing in this world that takes me back to my childhood like smelling grilled chicken with JH sauce!! 'scuse me, I've got to clean up all this drool I've accumulated in my lap!!! Different people like different flavors. A lot depends on what you're used to, especially if you grew up with it. I've yet to encounter a potato salad, a cole slaw, or a plate of fried eggplant that could even begin to compare with those my mother routinely whipped up for me. I grew up in Savannah and love the original Johnny Harris BBQ sauce. Most people I grew up with love it as well. The restaurant has been rather hit-and-miss over the last several decades, but we all still go there a few times a year, especially when old friends from Savannah come back to visit family or when old high school classmates get together over St. Patrick's Day. It's usually pretty d@mned good, although I wouldn't go so far as to put it up against the serious BBQ places around here such as Sandfly BBQ, B Cracklin' BBQ near Windsor Forest, or Southern Soul down on St. Simon's Island. 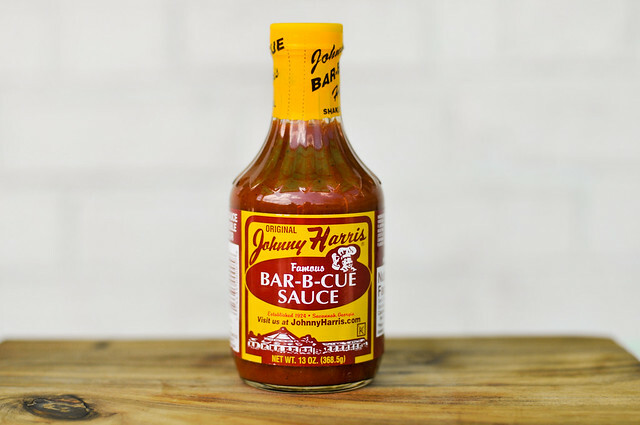 With respect to JH's BBQ sauce, however, I will point out that sometime in the 1990s, Food and Wine magazine (I think it was) did a taste test comparison of nationally available and several regional sauces, and Johnny Harris was selected as the best. Obviously, YMMV, but I would respectfully suggest that Johnny Harris sauce deserves more than the summary dismissal of a dismal 3 out of ten, only in a pinch comment provided by our reviewer, Josh. I am biased. I love this stuff but then I know that not everyone does. If everyone liked the same sauce, there wouldn't be so many different brands and versions within brands. I grew up on the stuff and don't like sweet sauces. I love it when they're cooking the sauce in the factory - it smells so wonderful. Growing up, we put it on everything and it was the primary condiment on all sandwiches. Love the original but don't care much for the others. I have a sister who loads up a suitcase with this stuff to take back home with her whenever she visits. I have friends and relatives all over the country who I ship it to (because realistically, it's cheaper if I buy it at WalMart or the grocery store and pack & ship myself than going through their web site). Johnny Harris original and MY slow-smoked pulled pork - an unbeatable combination amongst my friends and family. Johnny Harris is my family's favorite BBQ sauce, even after trying many others. We get it by mail order, and when we run out between orders, I struggle to find a remotely suitable sauce in the store. Most are much too sweet. My husband and I don't like sweet sauces. We like the vinegar, mustard and tamarind backbone of Johnny Harris. Sometimes we add Pick-a-Peppa sauce to it (the less spicy brown kind; not the red hot sauce), and the flavors are very compatible. Even our 7-year old, picky-eater daughter loves Johnny Harris sauce. We DO cook with it: my husband grills pork chops with it (starting them "naked", then spreading the sauce each time the chops are turned, cooking them long on a low fire). I oven-barbecue chicken with it (see The Pioneer Woman oven-BBQ chicken recipe). No, it does not caramelize like some other sauces, because it's the sugars that caramelize, and Johnny Harris isn't sugar-syrup-with-tomato-and-spices like most sauces. You would probably want a sweeter sauce for ribs. I can see that if you like sweetness, and are used to the typical sticky-sweet BBQ sauce, Johnny Harris would taste very strange. But it really is a matter of taste - remember that vinegar dominates BBQ styles in much of the Southeast and people are pretty passionate about that - and obviously a lot of folks love Johhn Harris. "The lack of sweetness and harsh vinegar made this not a very pleasant of sauce out of the jar". I read this and my first thought was.....Josh is either a Yankee or from California. IT'S A NORTH GEORGIA/SOUTH CAROLINA VINEGAR BASED SAUCE! It's supposed to be non-sweet and high in vinegar taste. Before you critique BBQ sauces, you'd better learn what you are tasting, what BBQ region it is from, and why it tastes they way it does. I actually add more apple cider vinegar to Johnny Harris' sauce because I think it has too much tomato sauce in it for a good pulled pork. 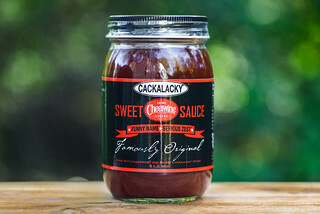 If you like your barbecue sauce cloyingly sweet, this will not be the sauce for you and, because of its lower sugar content, it will not do things that heavy amounts of added sugars will do, which are the very things this reviewer wants. If he'd known his basic food chemistry, he'd've known that and judged the sauce against other vinegary sauces, a test in which it would excel. In other words, a grown up palate not childishly dependent on overly sugary fare would know a wonderful thing in Johnny Harris Original sauce on tasting its complex goodness.